In the past and to this day, components have been moved to stationary machines which are each designed for one processing purpose. Like telephone cabins, these machines are millions of in production halls and do their usual tasks with the same precision. Extendable by additional features and automation connection, the stationary machines are still preserved for some time in the modern industrial age. achievable accuracies by a factor of 10 are worse than in stationary machines. This is where the concept of parallel kinematics is based on METROM's pentapod. As a machining concept that combines the precision and stiffness of the stationary processing machines with the mobility and freedom of movement of the robot. Everyone can gain the best benefit by individual integration of "technology apps" such as milling, friction stir welding, laser welding, additive fabrication and test methods. The design principle allows the unique mobile use due to the low moving mass and can also process the largest components without having to be big itself - or do you carry a telephone cell, the notepad, your library collection and your records? 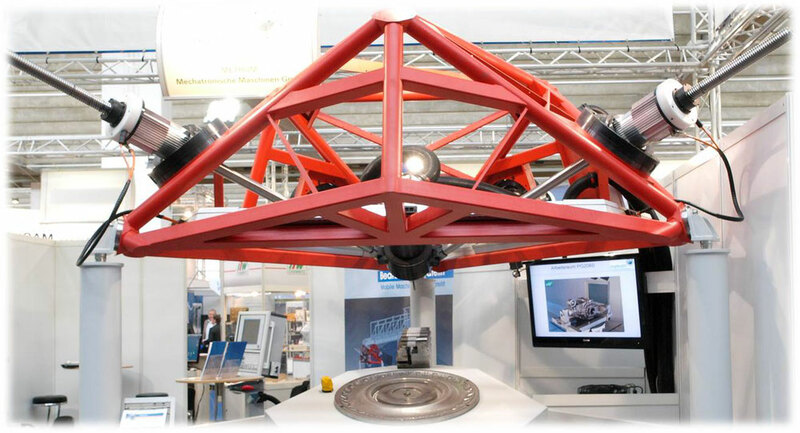 Convince yourself of the future in the proven mobile 5-axis parallel kinematics - from ideas to solutions for your smart production!